Some blogs have a regular feature where bloggers revisit earlier posts. I think this is a great idea. Partly that's because I have lots of new followers who might not have made it so far back in the archives yet. Mostly I think it might help me remember what I've written! I've also been working hard to create a Table of Contents page here at The Book Chook. Look for that soon. It'll make it much easier for you to browse articles or search for your particular interests. Less chaos in the Chook Yard! I was honoured to be included in a great line-up of useful blogs at Keith Schoch's blog, Teach with Picture Books recently. Check out his post, Great Minds Thinking Alike: Sites for Teaching Using Picture Books. Do take time to explore while you're there - Keith has wonderful resources to help us all get the most from picture books! Since January 31 is Backwards Day, let's look back to some TBC articles from January, 2009 and 2010. Can Books Be Our Friends? Access to kid-friendly books helps kids love reading. Revving Up Reluctant Readers Ideas that might help your kids switch on to reading. Celebrate the Joy of Language Puns, jokes and games involving words are great to share with kids. You'll find lots of book reviews in the archive at right under January 2009. What's So Great About Children's Literature? It's wonderful, that's what! Using Toys as a Springboard for Writing Writing and story-making ideas that revolve around toys. Into the Book A great reading comprehension resource for K-4. Make a Movie with the Zimmer Twins Tell stories using an online editor at Zimmer Twins that generates a little movie. Turn a Catalogue into a Classroom Some Book Chook ideas for making playful learning activities from flyers and catalogues. Have Fun and Develop Literacy Skills with Bookr Great little digital bookmaker. Boredom Busters Some Book Chook ideas for capitalising on kids' interests in play and learning. You'll find lots of book reviews in the archive at right under January 2010. Besides looking back here at The Book Chook, what else will you do to celebrate Backwards Day? Your kids might like to put their clothes on backwards, try walking backwards, or even reading and writing backwards. If you feel an urge to drive the car backwards, perhaps it's best to resist. I haven't really done a post like this before. It's a good idea! I think so too, Kel. Bloggers I've seen choose them based on different things like stats, comments, or how popular sites like Post Rank tell you the posts have been. I went with a combination, and a huge dollop of my own instinct. 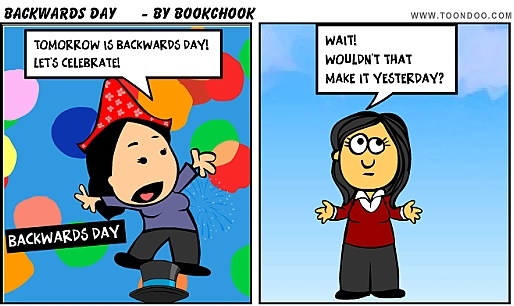 Backwards day, what a great idea! I often forget that not all of my readers have been with me since the beginning...must be mindful of that! Your blog has that wonderful scrolling banner at the top that highlights earlier posts which I like, Kelly T. Wowzio (top left) and Post Rank (top right) are a way for readers to find other posts, as of course is the blog archive. But I want to make it easier to navigate The Book Chook, so I'm working on a Table of Contents. I hope that will allow new readers to get a quicker overview of the content here that might interest them.